Let's face it. 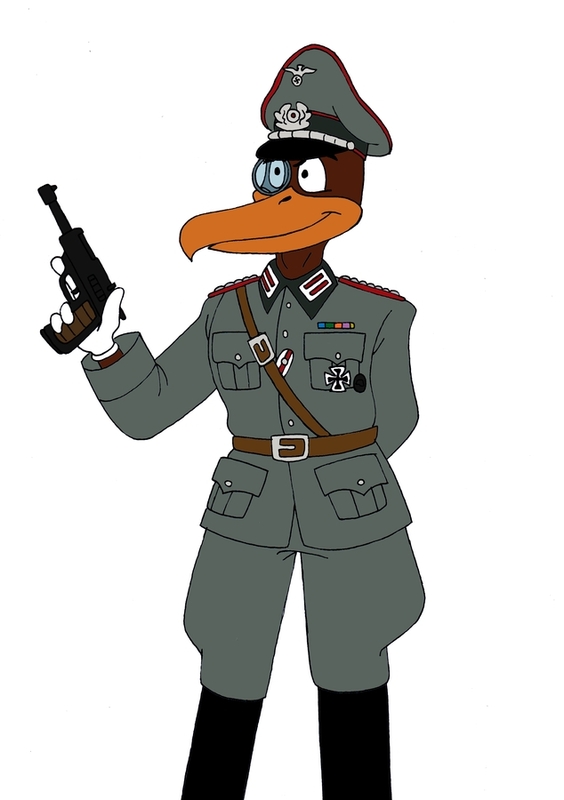 Von Vultur, the German officer vulture appearing in the Looney Tunes episode Daffy - The Commando has a few... inaccuracies with his uniform. It isn't just the lack of any overt World War II imagery (Swastikas, etc. ), but more the fact that almost everything about it is anachronistic. Von Vultur isn't dressed like a World War II officer of the Wehrmacht; the cut of his tunic (particularly the collar) is more like that of an Imperial German officer from World War I. So here he is in period-accurate (to the best of my ability) World War II-era Heer attire, with a few medals (including a Wound Badge as a reference to his frequent cartoonish injuries). I chose major as his rank mostly at random. The red trim on his uniform indicates that he is in the artillery division, since I seem to remember that he was operating big guns. That and it matches his original uniform from the cartoon, which also had red trim. I kept the white gloves both as a nod to the original episode and because I figured he could use them to search for dust or grease in order to ensure his guns were in tip-top shape. Schultz better start polishing! And, yes, I know I forgot his tail feathers. Sue me. Regarding the spelling of his name, it turns out it's "Vultur" not Vulture, as evidenced by the telegram he receives at the beginning. I saw this on the front page and recognized it instantly. That was one of my favorite cartoons growing up with.